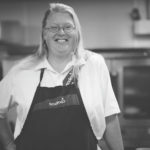 Norma Whitford is everyone’s favorite DC staple; she’s a long-term Sodexo employee and familiar figure during the rush of meal times. We sat down with her to uncover a bit more about the person we all know and love. Norma takes us through her career working for Sodexo to a chat about family life in small-town Greenville. What is one of your favorite memories you hold from all your years working for Sodexo Dining Commons? In high school we had a lot of fun. We played a lot. It was common to find us having a water fight in the dish room or sleeping in the Krober room. It was just fun. Now that I’m a mom and supervisor I have to be good. Do you have a favorite part of the year these days? Sodexo touches the lives of 75 million consumers in 80 countries every day. In North America alone, we serve more than 15 million consumers at 9,000 client sites. What is your favorite meal to serve? It has to be some of the Mindful Salads, and the oven-baked turkey with apricot glaze. I went to the New York Restaurant School and got a pastry degree. I love decorating cakes and making up new dessert ideas for the students. How many long have you worked here? Eight years at the college, but fifteen years with Sodexo. Do you have any words of wisdom for students after seeing so many move through the college? give up you can accomplish so much. Keep working.